I think my generation is the first group of people to really create bonds with other individuals via the internet, without ever having met one another face to face or ever intending to do so. These relationships can be as strong as more traditional friendships as well. For instance, I’m internet-friends with Kelsey at Apple A Day. No, I don’t know her favorite song and I can’t pick out a handbag that she’d carry, but I have known true happiness for Kelsey and true empathy for her. And sharing in emotions is surely a part of a friendship, whether or not you’d recognize the person on a busy street in NYC. I also know that Kelsey is getting married (very soon!) to the absolute love of her life. And that’s why I, along with a bunch of other bloggers, combined to throw a virtual shower in honor of that union. To see what everyone contributed, please stop by Amy’s blog or Kelsey’s Blog. Naturally, I needed to pick a recipe that Kelsey would love at a true get together, and that task wasn’t hard. I’ve picked up on a few of Kelsey’s favorite flavors over the years. I know she loves pizza. I know she loves sweet, caramelized onions. She rates this meal she made with squash as one of her best kitchen accomplishments. So I am quite confident that she would adore the appetizer I came up with for her party. 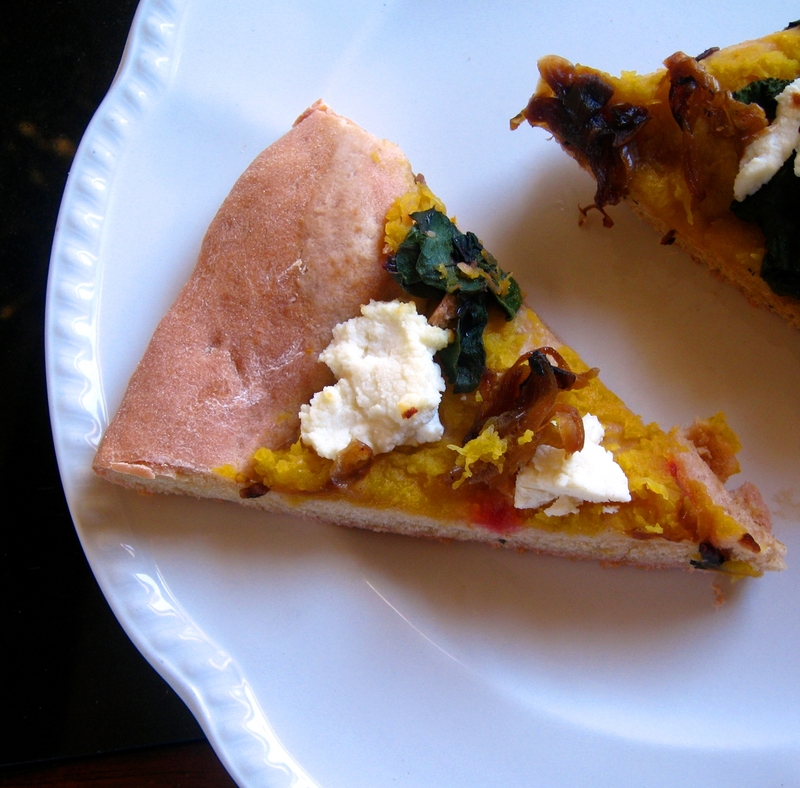 I made a Pizza with Acorn Squash, Caramelized Onions, and Beet greens. The dough was dyed pink using beet juice. Pink is one of Kelsey’s favorite colors so I knew she’d adore this (flavorless) addition. Just replace 1/2 cup of the liquid you use in your pizza dough recipe with canned beet juice. I wish Kelsey and her groom all the best. Cheers. Poke acorn squash several times with a sharp knife and microwave three minutes to soften. Meanwhile, preheat oven to 400*. Cut squash in half, remove seeds, and place flesh side down in a lightly greased glass cooking dish. Bake 25 minutes or until very soft. Remove from oven. Scoop out squash flesh and mash with the back of a fork until very smooth. Add 1-2 tsp of maple syrup to sweeten to desired consistency. Set aside. Heat a skillet over medium heat. Place a thin layer of oil in the pan and heat until shimmering. Add onion slices and reduce heat to medium low. Cook about 30 minutes until onions are brown, soft, and sweet. These two steps can be done days in advance. Wash beet greens thoroughly. Remove ribs and slice into ribbons. In a microwave safe bowl, add greens and about 3 T of water. Steam in the microwave until wilted. Roll pizza dough out to desired shape. Spread squash mixture over dough. 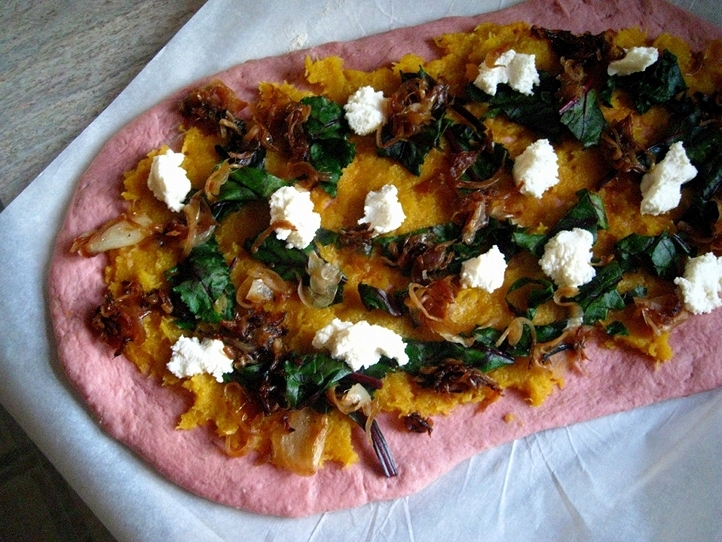 Arrange beet greens and onions evenly on top of dough. Dollop with ricotta cheese. Preheat your oven and pizza stone to 500*. Once heated, transfer prepared pizza to stone. Cook 5 minutes at this high temperature and then reduce to 400*. Cook an additional 10 minutes or until pizza is puffed, dough is cooked, and toppings are heated thoroughly. i loves these ideas—the pizza, and the virtual shower! congratulations to everybody! I love the first paragraph…because it is SO totally true to our generation. I actually just read a note from my internet friend prior to reading this blog. hehe. This receipe sounds yummy and now I want to give it a try. I’ll have to add these “new” ingrediants to my grocery list! Thanks! What a great idea to go with Kelsey’s favorites! The pizza looks great! I’m sorry but this looks so unappetizing!!!! It would look so much better without pink crust. I am surprised to find that you purposedly dyed it that way. Unless you’re making desserts of some sort, keep the pink out. Stacy, if I ever make a pizza for you, I’ll be sure not to dye it. Luckily the person for whom this meal was intended adores the color pink, even in her pizza dough. That’s what matters, in my opinion. I love that Branny made this pink! I think it makes it very special for a bridal shower, especially for my bridal shower. I love pink! Plus, Branny told you exactly how she made it pink, so all you’d have to do is reverse her instructions to leave it plain. A very healthy and delicious pizza! Love the acorn squash there. Lately I feel like I can’t get enough pizza, but I still need variety. This is definitely a good alternative to boring standbys. Branny, you’re absolutely right that I would love this pizza! Squash, onions, and greens…YUM! Tasty and figure friendly…what a perfect contribution to a bridal shower. Thank you so much for participating and thank you so much for your thoughtful words. I truly and genuinely appreciate it! I love the idea of a pink pizza, and these flavors sound amazing! I’m just in love with this pink crust! So clever!! Thanks for playing along, girl! Branny this is just awesome. I totally agree with you about the internet and friendships too 🙂 This is so sweet, and the pink crust is just lovely. Great flavor combinations, and beautiful! !